It was this tweet that caught my eye and reminded me what an amazing publishing company Peachtree Publications is. For #BlackHistoryMonth, celebrate the African American accomplishments, contributions, experiences, and stories that have shaped the history and legacy of our diverse country. Peachtree is a woman-owned, independent publisher creating children’s books that educate, entertain, encourage, and endure. They also publish breathtaking and beautiful diverse for kids. Here a few that I would recommend adding to your “must read” stack in honor of #BlackHistoryMonth. Here’s a look at some of their beautiful books for kids inspired by this post about Black History Month. Journalist Ida B. Wells faces the greatest challenge of her life as a tireless crusader for justice and civil rights. Author Philip Dray tells the inspirational story of Ida B. Wells and her lifelong commitment to end injustice. Award-winning illustrator Stephen Alcorn’s remarkable illustrations recreate the tensions that threatened to upend a nation while paying tribute to a courageous American hero. It is the summer of 1947 and a highly charged baseball season is underway in New York. Jackie Robinson is the new first baseman for the Brooklyn Dodgers—and the first black player in Major League Baseball. A young boy listens eagerly to the Dodgers games on the radio, each day using sign language to tell his deaf father about the games. His father begins to keep a scrapbook, clipping photos and articles about Jackie. Finally one day the father delivers some big news: they are going to Ebbets Field to watch Jackie play! Author Myron Uhlberg offers a nostalgic look back at 1947, and pays tribute to Jackie Robinson, the legendary athlete, and hero. Illustrator Colin Bootman’s realistic, full-color illustrations capture the details of the period and the excitement of an entire city as Robinson and the Dodgers won the long-awaited pennant and brought an entire New York community together for one magical summer. The son of an enslaved blacksmith learns that his father is using the rhythm of his hammering to communicate with travelers on the Underground Railroad. When Pa falls ill, it is up to him to help others along the journey—and also lead his family’s escape. Pa works hard as a blacksmith. But he’s got another important job to do as well: using his anvil to pound out the traveling rhythm – a message to travelers on the Underground Railroad. His son wants to help, but Pa keeps putting him off. Then one day, Pa falls ill and the boy has to take over. A powerful story of rhythm and craft in nineteenth-century America with beautiful oil paintings and back matter that includes more information about the Underground Railroad. Forced to work long hours, George was unable to attend school or learn how to read. But he was determined—he listened to the white children’s lessons and learned the alphabet. Then he taught himself to read. Soon, he began composing poetry in his head and reciting it as he sold fruits and vegetables on a nearby college campus. News of the slave poet traveled quickly among the students, and before long, George had customers for his poems. But George was still enslaved. Would he ever be free? It is 1864, and twelve-year-old Gabriel loves to help his father care of the thoroughbred racehorses on Master Giles’s farm in Kentucky. But the violence of the Civil War breaks out and Gabriel’s father leaves to enlist in a Colored Battalion, bringing the arrival of Mr. Newcastle, a white horse trainer with harsh, cruel methods for handling horses and people. Now i’ts up to Gabriel to protect the horses he loves from Mr. Newcastle and keep them safely out of the clutches of Confederate raiders. Alison Hart mines the complex relationships of the Civil War in Gabriel’s Horses, the first book in a gripping historical fiction middle grade series. Read an excerpt here and find the Teacher’s Guide here. Continue reading the Racing to Freedom Trilogy with Gabriel’s Triumph and Gabriel’s Journey. Cynthia Levinson tells the inspiring story of one of the greatest moments in civil rights history as seen through the eyes of four young people who were at the center of the action. 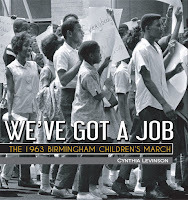 We’ve Got a Job: The 1963 Birmingham Children’s March tells how Audrey Hendricks, Wash Booker, James Stewart, Arnetta Streeter and 4,000 black elementary, middle, and high school students succeeded where adults had failed in desegregating one of the most racially violent cities in America. If you are interested in We’ve Got a Job, also check out our Teacher’s Guide here. 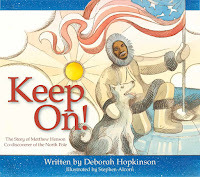 Deborah Hopkinson brings us a stunning picture book Keep On! The Story of Matthew Henson, Co-discoverer of the North Pole which tells the story of the under-recognized Matthew Henson who joined Robert Peary’s great 1909 expedition to reach the North Pole. The team endured storms, shifting ice, wind, injuries, accidents, and unimaginable cold. Finally, on April 1, Peary, Henson, and four Inuit men began the final 133-mile push to the Pole. For more resources, check out our Teacher’s Guide for Keep On! here.